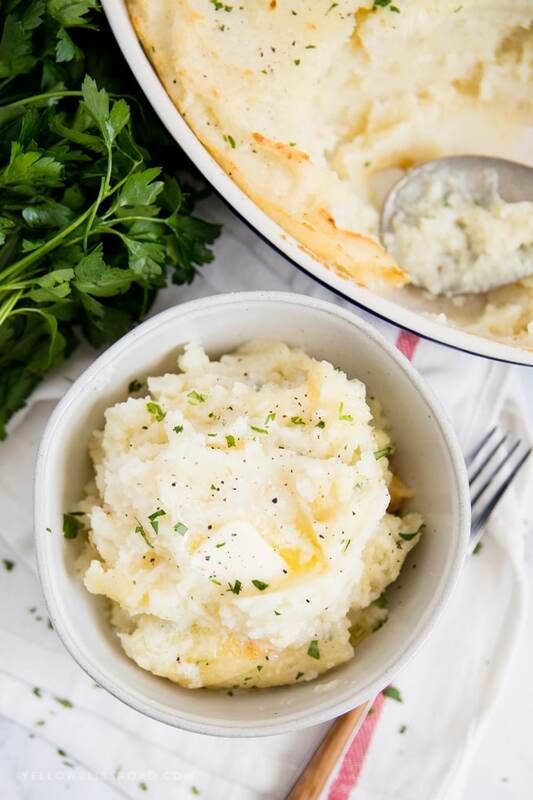 Fluffy, creamy and so flavorful this Make Ahead Mashed Potatoes recipe is a simple and easy side dish that will be the star of your weeknight dinner or holiday feast. 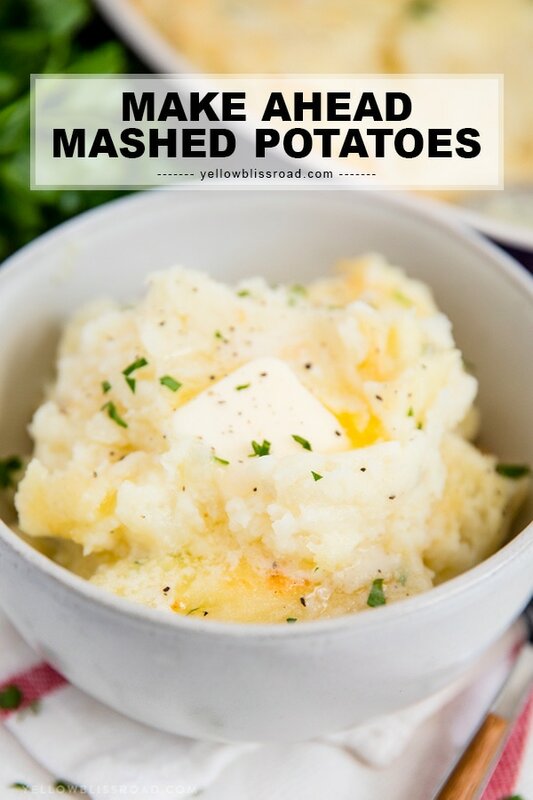 These are by far the best Mashed Potatoes EVER! Serve them with classic favorites like Chicken Fried Steak Recipe and a Cheesy Broccoli Casserole for the ultimate comfort food meal. When I was a young adult, I took over the mashed potato making for family gatherings. 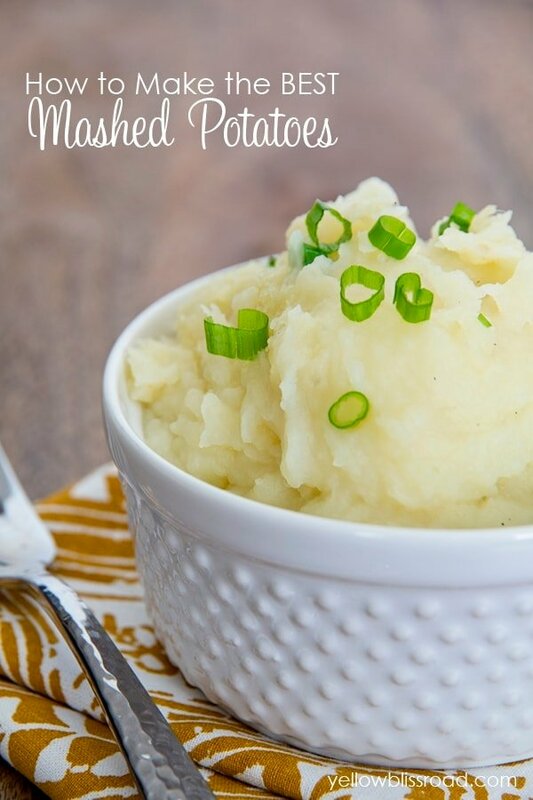 I had come across an easy, make ahead mashed potato recipe from Betty Crocker and I have since become the self-proclaimed mashed potato queen of our family. Unfortunately for me my children do not like mashed potatoes. Yes it’s true. They are the only children on the planet who do not eat mashed potatoes, and it makes me incredibly sad because I love them! 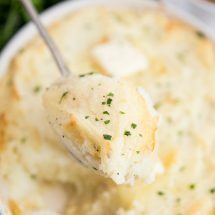 I mean seriously, mashed potatoes are in the realm of the ultimate comfort food, right up there with my One Pot Creamy Chicken and Noodles! 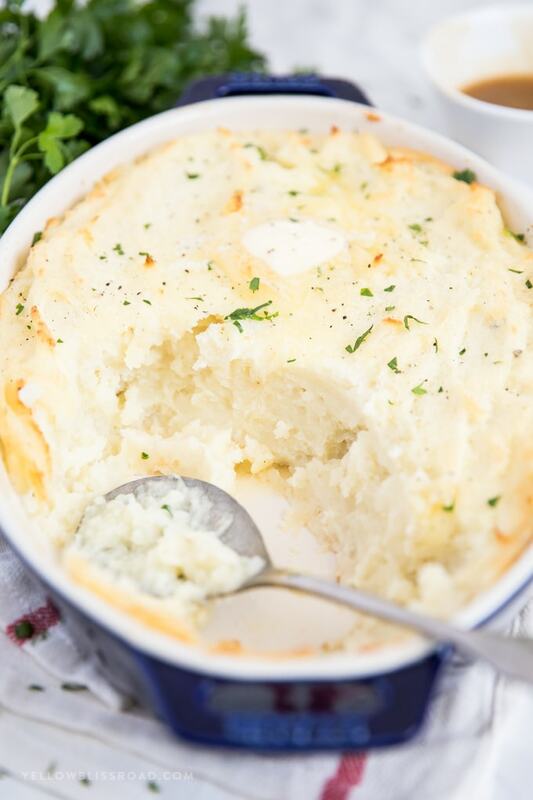 I like them pretty simple – no fancy whipped potatoes or crazy ingredients, just milk, cream, butter and salt. Lots of salt. That’s the key to the best mashed potatoes! For this recipe, you just need some basic ingredients: 3 pounds of potatoes, butter, milk and cream. Boil a few inches of water in a large pot. 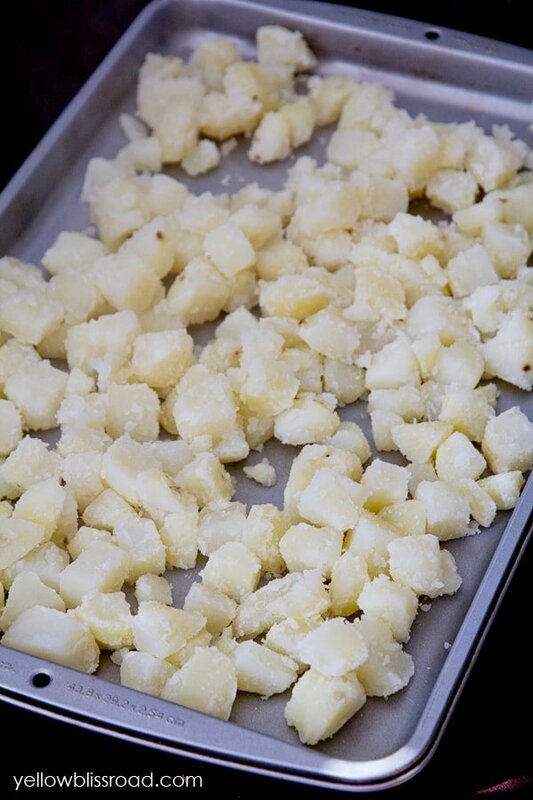 Once it starts boiling, add a handful of salt to help flavor the potatoes, and add your peeled and chopped potatoes. Once they are fork tender, drain the water and put the potatoes back into the pot. 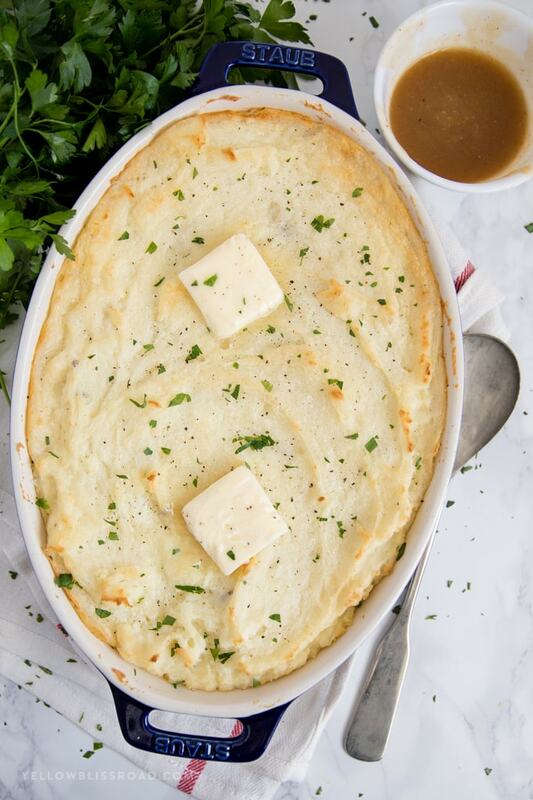 Melt the butter, milk and cream together in the microwave (or in a small saucepan on the stove) and stir into the potatoes, reserving about a 1/4 cup for later, then pour them into a large baking dish. At this point you can either cover them with foil and pop them in the fridge overnight or cook them right away. 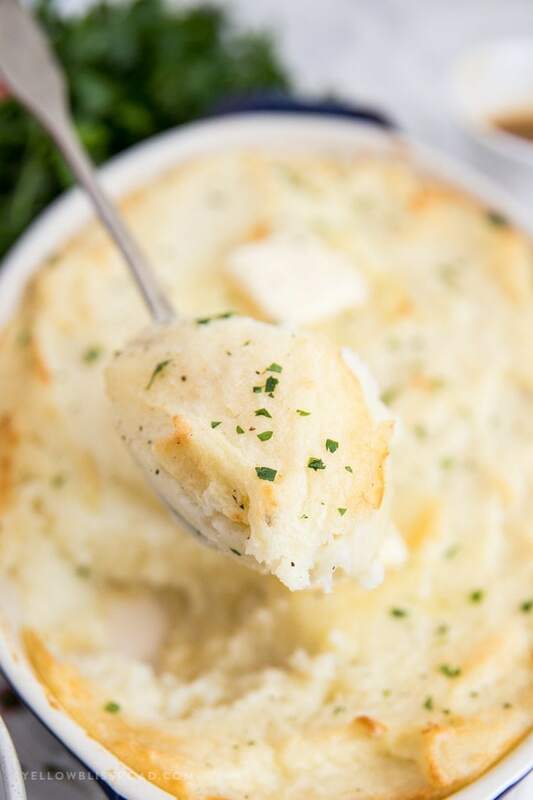 When you’re ready to heat them up, just pour that extra reserved butter mixture over the cold mashed potatoes and pop them in the oven until they are warmed through and golden on top. 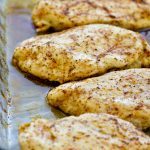 They get such a yummy, slightly crispy top on them – I could eat them straight out of the pan. Stir them up and serve. Or grab a fork and just dig in. Your call. Dice the potatoes in even sized chunks. This helps them to cook evenly. Salt the water. A lot. The potatoes absorb the water and the salt helps bring out the yummy flavor. Melt the butter and heat the milk. Rather than trying to melt the butter into the potatoes, heat the milk and butter up so they are the same temperature as the potatoes. No risk of cooling the potatoes or curdling the milk. For added flavor, add a teaspoon of garlic powder or a few minced cloves of garlic and some fresh shredded cheddar cheese. Garnish with fresh minced parsley or chives and freshly cracked black pepper for a beautiful presentation. Do you have any tips you’d add to my list? Unfortunately once your mashed spuds have become sticky and gluey, there is no going back. This result can happen when the potatoes aren’t drained well enough or have been overcooked, but most often this is caused by over-mixing. The more they are mixed, the more starch is released which is what caused that gummy texture. 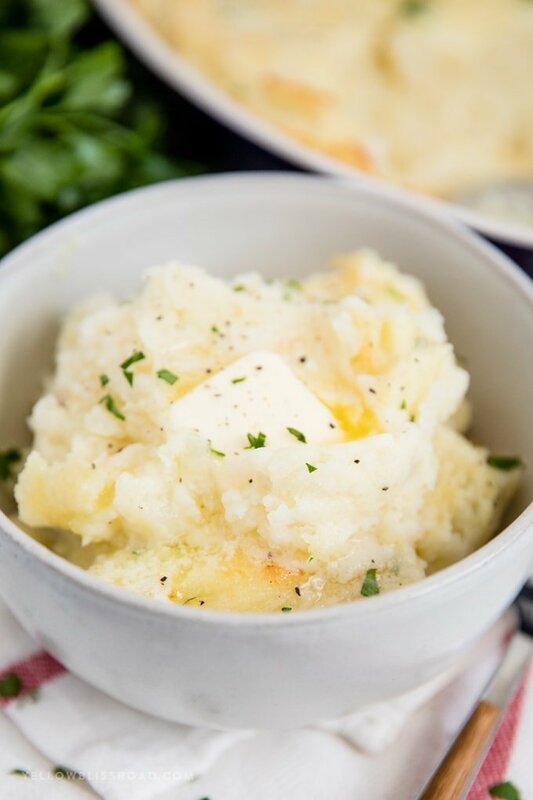 Fluffy, creamy and so flavorful this Make Ahead Mashed Potatoes recipe is a simple and easy side dish that will be the star of any meal. Rinse, peel and dice potatoes into one inch chunks. Place potatoes into boiling water and cover. Cooking over medium heat for 20-25 minutes, or until potatoes are fork tender. Place potatoes back into the pan and sprinkle with 1 teaspoon salt. Mash well. In a small saucepan, add butter with milk, cream, and 1/4 teaspoon pepper, and place over medium-low heat until butter is melted. Reserve 1/4 cup and set aside. (Or melt in the microwave). Pour the half of the butter mixture over the mashed potatoes and mix well. Add more of the butter mixture until potatoes are light and fluffy. Pour potatoes into a greased 9"x13" pan. 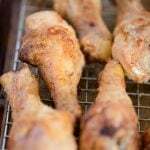 Cover and refrigerate for up to 24 hours. Pour remaining butter mixture over the top of the potatoes (you may need to melt in the microwave). Bake uncovered in a preheated 350 degree oven for 40-45 minutes. Stir before serving, if desired. *If baking immediately (while potatoes are still hot), reduce baking time. Did I read this correctly that you only cook the potatoes in 2” of water? I’ve always covered them completely but then again maybe that is why I don’t make good mashed potatoes! In theory, when using a 5 quart pot, 2 inches should be enough to cover the potatoes. But yes, they should be covered with water. I updated the recipe to make that more clear. Can I just heat them up on top of stove instead of casserole dish? I will be making 15 lbs. These taste like just made, correct? I don’t want 30+ people thinking they are day old but time wise this would help me out! Yes you can make them on the stove. Just mash them in the large pot and add the cream/butter mixture. I would start with maybe half, and then adding 1/4 cup at a time. 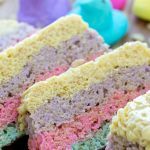 Since the baked version calls for pouring some on top, you don’t want them to be too thin. These look amazing. 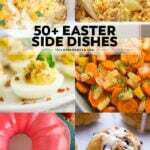 I can’t wait to try them, do i dare try a new recipe on thanksgiving day? Especially with such a staple menu item?! yeah… i think I’m going to try it!! What’s the green stuff sprinkled on top? Sprinkled on top would be parsley. And I promise you they are amazing!! I need to cook for a crowd. Do you think this can be doubled and put in an extra large casserole dish or would you make two separate batches? Also, could you use gold or red potatoes for this method, skin on or off? 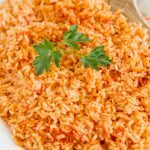 This recipe is pretty flexible, so yes to both questions! Does it really take 45 minutes to heat these through? I don’t want them to burn. 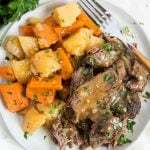 Can these potatoes be done in a slow cooker? I haven’t tried with this specific recipe. 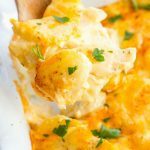 Can I make these potatoes 2 day before? Hi! Yes you can definitely make them two days ahead. Just cover and refrigerate. 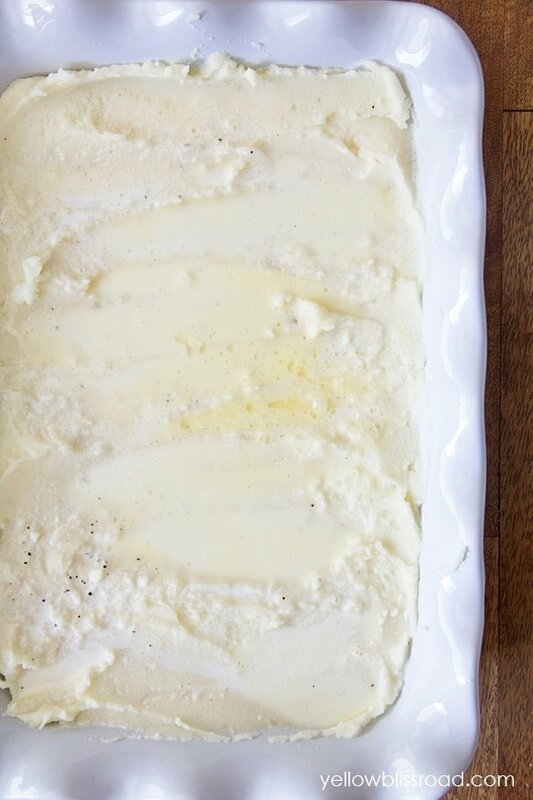 I make a day ahead version too, but I use softened cream cheese. I also dry my potatoes, but after draining, I place them back in the pan over low heat. As I mash and stir them around, they dry and the steam escapes. I use about 1/2-3/4 c. half and half, and 1 stick of butter (also softened) and an 8oz package of cream cheese, softened (Philadelphia is the best!). I put that all in after the first mash and gently stir it all together. You’re right! Never use an electric mixer on potatoes or you will get the equivalent of glue! While I do cook them in salted water, I think the amount of salt you may be encouraging newer cooks to add, may be their downfall. After I add the aforementioned ingredients, keeping in mind that I sometimes use salted, or sometimes unsalted butter, I taste the potatoes. It is only then that I add more salt if needed. And then it’s Lowery’s seasoned salt, in small amounts and tasting after each addition (Oh OK, I’m “snacking”, but that’s tasting isn’t it?). It took me many years as a new cook to really figure out the amount of salt that is in salted butter, and face it, that is what most new cooks use. I’m only adding these suggestions now, because it’s “tis the season” and many new cooks will be producing their first family Thanksgiving dinner. 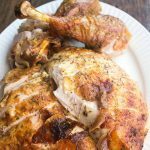 I personally make ahead as much of the meal as I can, then we deep fry the Turkey (90 mins tops). And after years of being all-in the kitchen, have turned into let me shove this in the oven, set the timer, will be right back! I hope you don’t take offense, but salt is a powerful thing and can make or break a dish. And this is coming from someone whose greatest treat is eating a lemon like a grapefruit sprinkled with a lot of SALT. Not against salt at all, where would we be with out it? Just want new cooks to be successful as they search for recipes for their family dinners. I use evaporated milk and as much butter as I dare.. Never thought about salting the water…will do that this time. It sounds weird, but adding just a splash of vanilla will blow your mind. 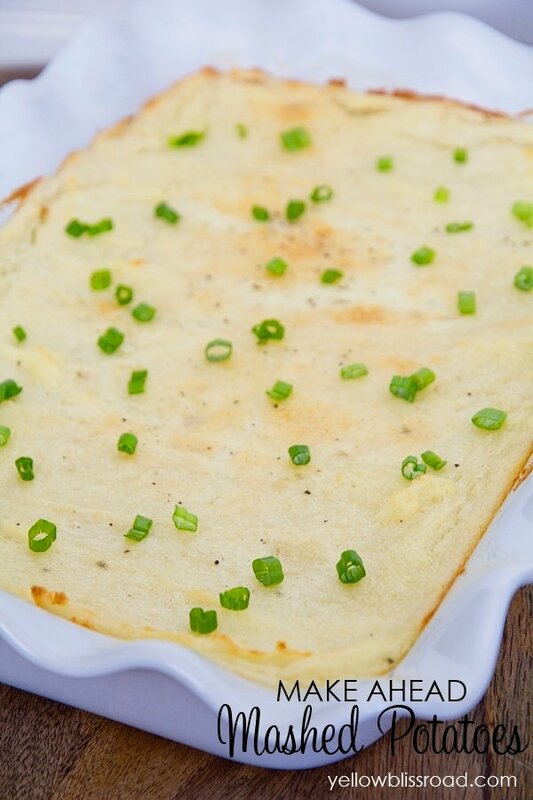 We first had it at a fancy restaurant–vanilla bean mashed potatoes. Now, we’re never going out and buying vanilla bean, so we just use a bit of extract. It’s delicious and very very subtle. People will remark that the potatoes are tastier, but they won’t be able to tell why. I promise it’s good!